anterior, and 1 lower anterior veneers; 3 upper anterior bridges; and 1 upper bicuspid onlay. Sixteen restorations were placed with Variolink Esthetic LC and 200 with Variolink Esthetic DC. Three teeth were extracted at recall for reasons unrelated to the restorations. Two hundred and thirteen restorations (99%) placed with Variolink Esthetic (16 with LC cement and 197 with DC cement) received an excellent rating of five for esthetics (Figure 3). Clinicians commented on the excellent esthetics. 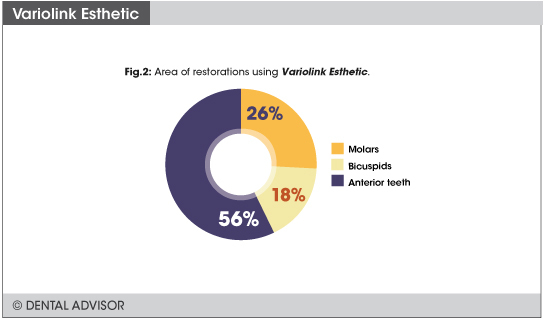 Two hundred and fourteen of the 216 restorations placed with Variolink Esthetic received an excellent rating of 5, with no reports of sensitivity (Figure 3). 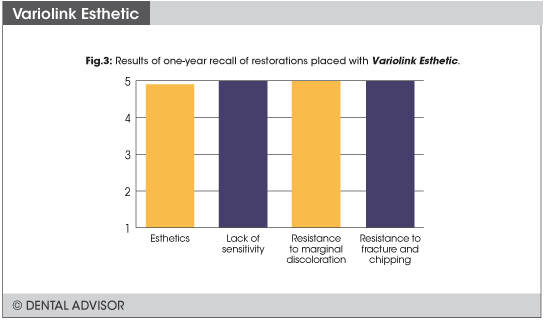 All recalled restorations (100%) placed with Variolink Esthetic received an excellent rating of five (Figure 3). No microleakage was observed. At recall, 214 restorations placed with Variolink Esthetic were intact and received an excellent rating of five (Figure 3). Two restorations fractured but these failures were deemed not related to the cement. 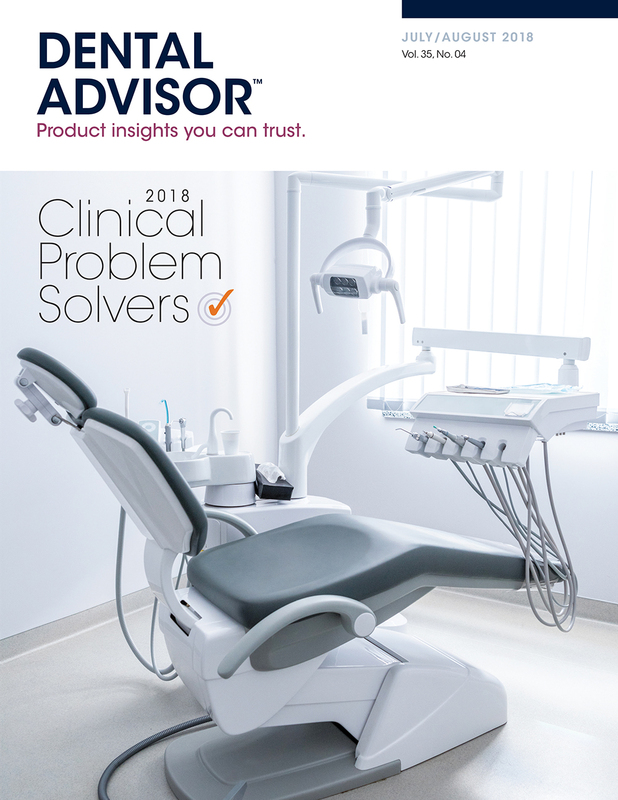 Over the 18-month recall period, the clinical performance of recalled restorations placed with Variolink Esthetic was exceptional. Esthetics was excellent, as were the lack of sensitivity, resistance to marginal discoloration, and resistance to fracture/chipping. The restorations will continue to be monitored over time. ceramic and resin composite restorations. 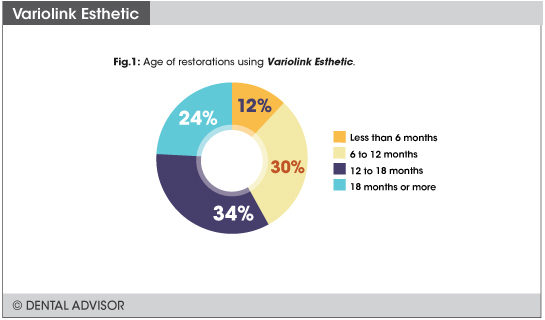 Variolink Esthetic combines features of its predecessors, Variolink® II and Variolink® Veneer. It is available in light-cured (LC) and dual-cured (DC) versions. Variolink Esthetic contains the patented light initiator, Ivocerin, which is 100% amine-free for enhanced shade stability. Variolink Esthetic LC is indicated for use with glass-ceramic, lithium disilicate and composite restorations such as inlays, onlays, and veneers with a material thickness of less than two millimeters and sufficient translucency for light penetration. Variolink Esthetic DC is designed for cases in which full light-curing cannot be achieved, including opaque ceramic and composite inlays, onlays or partial crowns, and crowns and bridges. Each formulation has five shades available: Light+, Light, Neutral, Warm, and Warm+. Variolink Esthetic LC is supplied in 2 g syringes, while Variolink Esthetic DC is available in 5 g and 9 g (Light, Neutral and Warm shades) automix syringes.